Urology (aka: genitourinary surgery) is a surgical subspecialty that tackles a wide spectrum of diseases involving the male and female urinary tract, the male reproductive system, and the female pelvic floor. Urologists manage afflictions ranging from genitourinary malignancies (renal cell carcinoma, prostate carcinoma, transitional cell carcinoma, testicular carcinoma, etc. 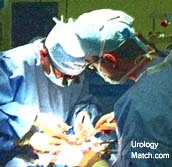 . .) and renal stones to congenital genitourinary defects, perineal reconstruction, and male infertility. Calculi: Medical, endoscopic, extracorporeal, percutaneous, and surgical management of stones of the urinary tract. Female Urology: Medical and surgical management of incontinence and pelvic outlet relaxation disorders. Infertility: Medical and surgical treatment of male infertility. Pediatrics: Medical and surgical treatment of urological disease in the pediatric population. Neurourology: Urodynamic evaluation of patients; medical and surgical management of voiding disorders and erectile dysfunction.